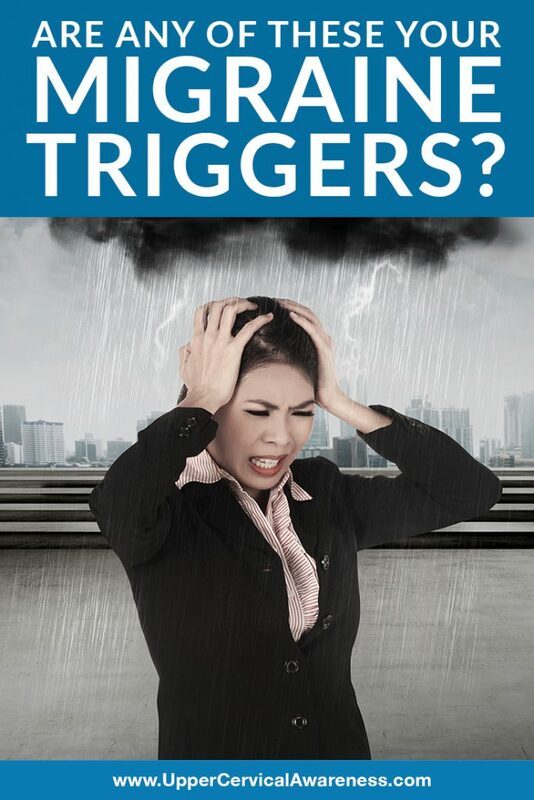 Are Any of These Your Migraine Triggers? Home/Migraines / Headaches/Are Any of These Your Migraine Triggers? If you are one of the 39 million Americans who suffer from migraines, you probably realize that triggers vary from person to person and that most people have multiple triggers to watch out for. We’re going to take a look at some of the most common migraine triggers according to a 2014 study. Then we will look at a natural therapy that is providing hope for many and has helped relieve migraines in as little as one or two visits in case studies. Nearly everyone who gets migraines feels that stress is the trigger they deal with most, and that makes sense. First of all, stress is stored in the muscles of the neck and neck pain is a migraine symptom for about 75% of sufferers. Second, stress releases hormones into the body, and hormone fluctuations are another major trigger (we’ll get to that in a moment). Stress can trigger a migraine when it starts and causes hormones to be suddenly released, but it can also trigger a migraine when the stressful situation ends and the hormone levels suddenly drop. The only way to deal with this trigger is to find positive ways to cope with stress when it comes up. That will reduce the hormone fluctuations and the stress that results in tension of the neck area. Lights – Bright lights can set off an attack, so be sure to have your sunglasses with you when you leave the house, even if the morning is cloudy. If the sun peeks out later, you can be in trouble. Also, watch out for glare from screens such as monitors and mobile devices. Most eyeglass companies now make lenses that are anti-glare and block blue light. There’s no research on it yet, but perhaps these will help you to see fewer migraines. Sounds – Whether the sound is loud and sudden or just repetitive, overstimulation of hearing was actually the sensory stimulus that was reported by the highest percentage of migraineurs. This can also be one of the tougher ones to avoid. The problem with loud and sudden sounds is it can be tough to predict when they may happen. From the shriek of a child to the bark of a dog, this is one of those triggers that just happen sometimes. Scents – Try to avoid having cleaners with a strong chemical smell in the house. You will also want your household to avoid wearing strong perfumes or colognes if you have this problem. Most of the time, a good friend will be understanding of this as well since more and more people are sensitive to strong smells, even if they don’t get migraines. According to the researchers, 39% of migraineurs suffer from weather triggers, and other studies show that number may be higher. This is a tough set of triggers to deal with because you can’t control the weather and weather predictions are often wrong. Plus, weather triggers vary from temperature and barometer fluctuations to the proximity of lightning strikes. Short of moving somewhere that your particular weather triggers are less common, these triggers are impossible to avoid, and climate change is making it tough to know where you can go to avoid certain triggers. Fatigue – Try not to wear yourself out on your good days. And be sure to get sufficient sleep at night. Many migraines are triggered by changes in sleep schedule or simply overdoing it. Missing meals – It is important to have a regular meal schedule if this is one of your triggers. If you can’t break away from the desk at lunchtime, be sure to have plenty to snack on to hold you over. Better to take a short food break at work today than to miss tomorrow altogether. Hormone fluctuations – We mentioned this while discussing stress, but for women who get migraines, there are other hormone fluctuations to worry about. Migraines can get worse during menopause, pregnancy, or during certain parts of your monthly cycle. Yes, the triggers of migraines are many and varied, but there is a single underlying factor that is often overlooked when it comes to the origin of migraines – an upper cervical misalignment. This can result in reduced blood flow to the brain, inhibited cerebrospinal fluid drainage, and pressure on the brainstem. These are all contributing factors to migraines. So how can you have this subtle misalignment corrected? We would like to introduce you to upper cervical chiropractic care. In case studies, some migraineurs saw a complete resolution of the condition after just one or two gentle adjustments. Can this subspecialty of chiropractic do the same for you? If you are ready to learn more, use the search feature on this site to find one of our preferred practitioners in your area. You may be about to take your first step toward getting out from under the burden of migraines for good. Dr. Gottlieb2019-02-02T17:28:50+00:00December 16th, 2018|Migraines / Headaches|Comments Off on Are Any of These Your Migraine Triggers?